State Board of Education President Michael Kirst and State Superintendent Tom Torlakson expressed support Friday for nine districts’ application for a waiver from the No Child Left Behind law. In letter to the U.S. Department of Education, they also raised questions about how the waiver would be implemented and enforced. The CORE waiver proposal is based on three principles: 1) College- and career-ready expectations for all students, 2) State developed differentiated recognition, accountability and support, and 3) Supporting effective instruction and leadership. Source: CORE PowerPoint (Click to enlarge). The districts, serving more than 1 million students, have formed a nonprofit organization, the California Office to Reform Education, or CORE. They submitted a unique request for a multi-district waiver, because the federal government last year rejected California’s application for a state waiver. A waiver would give the districts flexibility to use more than $100 million of federal Title I money for low-income children and to propose creative ways to improve their lowest performing schools. It would also free them from other NCLB penalties, such as notifying parents that their schools are failures. The nine unified districts are Los Angeles, Fresno, Long Beach, San Francisco, Clovis, Sanger, Sacramento City, Oakland and Santa Ana. 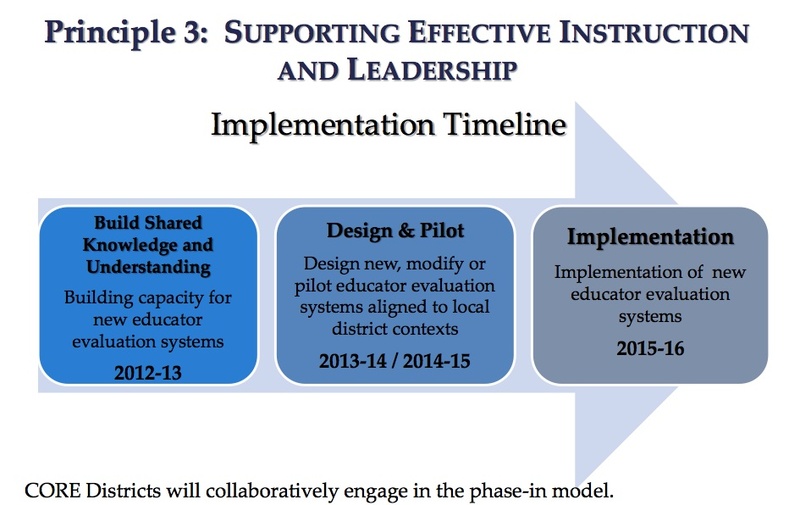 How the state Department of Education would carry out dual NCLB monitoring systems, one for districts that have a waiver and one for those still under NCLB’s provisions, and how a district waiver would mesh with state laws. How districts other than the nine applying would go about obtaining a waiver and whether they could create their own version. CORE has said the waiver process would be open statewide to all districts and charter schools that agree to the federal requirements and CORE’s conditions. 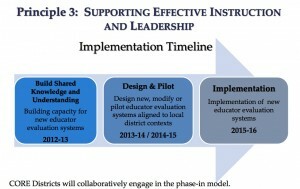 What criteria federal officials planned to use in approving the CORE districts’ waiver. Noting that the CORE superintendents also expressed their preference for a state waiver, Kirst and Torlakson wrote they would continue to “explore options” for one with federal officials. So far, 45 states either have received a waiver or have applied for one. The last deadline for applying was in February. Kirst said he had not given up hope that the state could still obtain a state waiver to take effect this fall, although he acknowledged that U.S. Secretary of Education Arne Duncan has not indicated that he’d still be open to granting one to California. Kirst said that the state was not competing with the districts seeking a waiver. “We are not trying to impede it in any way,” he said. Federal government denies California a state waiver, December 2012. My interest is how beginning reading is being taught to English language learners. For years I have asked the State Department of Education and foundations to do a pilot study on the Pecci Reading Method. (www.OnlineReadingTeacher.com) My last contact was with a State person this year, who told me that the State Department cannot do any pilot study, ONLY a school district can do one. Ms. Pecci has writen a series for kindergarten and first grade. The three Pre-Primers are meant for kindergarten. She wants the children to know the Pre-Requisite skills before they are taught to read words. 1. Knows the alphabet order and can identify the upper-case and lower-case letters. The Pre-Primers have great stories. PLEASE STUDY MARY PECCI’S WEB SITE. Studying beginning reading has been my hobby, on and off, for years. I will be giving the books to my two youngest granddaughters soon. The Association of California School Administrators strongly supports the CORE Waiver. We participated in the development of the template and we believe it is more comprehensive and rigorous then NCLB. Those concerned these 9 exemplary districts won’t be held accountable are wrong. If the data does not show student academic achievement growth then districts will be required to revert back to the old NCLB requirements. In addition, the CORE waiver application and principles if approved, will be available to any district to apply if they meet the requirements. Many are considering this now and are just awaiting federal approval. California should have right to better serve their students with precious dollars than the current top down NCLB mandates. Apologies to all for being the only one to comment. I guess the rest of california has gone to sleep..
First off, they are not mandates. States and/or districts can choose to opt out. Have any of the CORE districts indicated why they don’t do that? Secondly, the waiver simply imposes a different set of top-down ‘mandates’. Anyone who is against NCLB because it imposes ‘top-down mandates’ should be against the waivers for the same reason. Notifying parents their school is a failure is a penalty? In reality, the ‘problem’ with that process is actually the definition of failure, not the notification. Once again, we address the symptom instead of the disease. Hi Sherry. Apologies for appearing to pick on you, but you chose to comment here and I have some questions related to your group. One of the things I’ve always found curious about most ‘reform’ efforts, including but not limited to RTTT and even things like the CORE waiver request is the common absence of any accountability for centralized administrative staff. I was struck by the recent teacher survey done, by of all groups the Gates Foundation, that made pretty clear that if there is anything impeding learning and teachers being successful, it is the absence of support, both from district staff/structures and in terms of resources (most critically human ones). The irony of that report was that teachers didn’t even much mind being evaluated, but made it clear that that alone wasn’t going to help anything. In fact, in my view, any time there is a failure at the teaching level, it is directly attributable to a failure at the principal level. And a failure at the principal level is very clearly a lack of proper management, guidance, hiring and support at the district level (the whole reason central admin exists). Yet the ‘solution’ always seems to be to evaluate only teachers (and sometimes principals), and not the people who are in charge of them (the latter directly, the former via hierarchy). Anecdotally, I have yet to meet actually meet a truly incompetent teacher (luckily perhaps–I’m sure they are out there somewhere; at least that’s what people say). I have met a number of incompetent principals. And I have met quite a few incompetent or perhaps merely apathetic central administrative staff. Why are district administrators left out of accountability efforts when their failures can clearly reach down to the school and even classroom level? Does your group have a stance on that given that you represent those positions? Btw, the waiver does not mandate returning to NCLB if a district fails to achieve the metrics, it only says that ‘can’ and ‘may’ happen if the CORE board decides so. It would have been quite easy to put a ‘shall’ there if that were really the intent. The California Office of Democrats for Education Reform (DFER CA) continues to SUPPORT the CORE waiver proposal submitted to Secretary Arnie Duncan, and urges the Secretary’s approval. While a letter was released opposing the CA CORE application and including the DFER logo among other organizations, that view reflected the DC branch and was, unfortunately, submitted without input from the CA DFER office which has long supported the CORE waiver request. DFER CA reiterates our call to Secretary Duncan to approve the CA CORE waiver application.